I Wonder…Does The Hairy Tarantula Comb Its Hair? Have you ever thought about walking a pig? How about dressing a bunny in doll clothes? How would you like to comb and fluff the fur of a longhaired hamster? Pets can be forever friends, but they also need a lot of care. Be sure to read about your pet before you buy it. Here is some fun information about strange and unusual pets! Do Hermit Crabs Like to Live Alone? Can A Pet Ferret Be Friends With A Dog Or Cat? Do Cockatiels Crow Like Roosters? Is It True That A Rat’s Teeth Grow All Its Life? Do Mynah Birds Learn Quicker Than Parrots? Learn the answer to these questions and many more in this fascinating 15-minute book about unusual pets. With a fun question, each page introduces a new strange pet and tells some fun information about it. 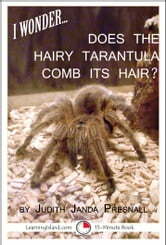 Books related to I Wonder…Does The Hairy Tarantula Comb Its Hair?